In today’s globalized world, the influence and dynamic nature of French gastronomy are clear to see. But in this context of intensified exchange, opening up to culinary cultures from all over the world has become indispensable. For 120 years, Le Cordon Bleu Paris has been teaching gastronomic culture and know-how in the French style, while opening up to the national cultures of the Chefs and students who are welcomed to the school each year. From its early days, the Paris school began to welcome students from overseas. The first Russian student attended the school as early as 1897, and the first Japanese student was welcomed in 1905. So it makes perfect sense that the school should move toward an approach to cooking that’s open to all cultures. Soon, more schools opened all across the globe, making Le Cordon Bleu the biggest employer of French Chef Instructors in the world today, promoting know-how and the gastronomic and cultural prestige of France. Each year, the Le Cordon Bleu Paris school Chefs travel to many countries to share their expertise. 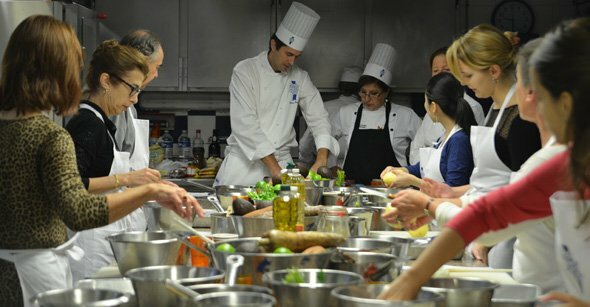 Le Cordon Bleu Paris often has the opportunity to promote world cuisine in France through a variety of culinary events. For several years now, world cuisine has also featured in the program of workshops and short courses offered to members of the public. Chefs from overseas come to the school to share their know-how alongside the school’s Chefs, offering budding Chefs an authentic insight into the cuisine of many different countries. The school has welcomed Peruvian, Indian, and Thai Chefs to conduct workshops, spicing up the menu!